It's not easy to pursue a hobby like sewing or crafts without the right tools or space in which to work. For years I didn't have a table big enough to use as a cutting board so I'd throw my fabric on the floor where it could be spread out. That resulted in many aching backs and sore knees. A dedicated sewing or craft room allows you the luxury of not having to constantly make the room look presentable. If you're in the middle of a project you can just close the door when you have company. When you go back to your project, everything is just where you left it. If you're lucky enough to have such a space in your home or if you are planning to create one, here are some ideas for making the room more than just a place to store your sewing machine and notions. It doesn't need to cost a fortune to design a very special retreat where you can be creative and enjoy your surroundings. If you think creating a sewing room involves shelling out thousands of dollars, take a look at the sewing room in this article's lead photo. All of the cabinets pictured were purchased at a building surplus supply store for less than $500. The counter top material consisted of two sheets of laminate that were stuck in a discount bin at Home Depot. Each cost $10. One was cut in half to serve as the back counter and one was used full size to create the working peninsula. Minimal woodworking knowledge was all that was necessary to secure the counters onto the cabinets and trim it with simple molding and drawer pulls. The extremely inexpensive bookcases above the counter were from Ikea. Ikea is also a great source for reasonably priced base cabinets and a huge selection of table and counter tops in many sizes, styles and price ranges. With a little imagination, those pieces can be configured into any size work space for a sewing or craft room. Having a place to store all your sewing needs is critical to keeping your room organized. Plan a variety of storage spaces, some enclosed and some open for items used regularly. Also vary the size of the storage spaces. Customize the inside of cabinets by using small baskets to contain similar objects. Include shelves for sewing books and miscellaneous supplies. You can find a large selection of craft organizers online to suit your needs. With all the small items used in sewing, drawers can get pretty messy. Instead of spending a fortune on customizing the insides of drawers, buy inexpensive plastic organizers to group things like scissors, tape measures, needles, machine attachments, etc. You can find containers for less at dollar stores and garage sales. Also keep your sewing room in mind the next time you receive a gift in a sturdy small box, especially if it has a lid. Storage containers with separate compartments and slide out drawers work well to hold small items like thread spools or buttons. Clear fronts allow you to see what you have at a glance. This kind of storage can be found at sewing and craft shops. But check out the tool departments at Home Depot and Lowes and you might find greater selections and lower prices. Also look for fishing tackle boxes at sporting goods stores and garage sales. These boxes usually contain many individual sections for small items. If your sewing room has a closet, you already have a built in storage area. You don't need to buy costly closet organizers to make the space usable. Look for cubes at home improvement stores as well as Ikea and stack them to create the ideal storage area. Large cubes are the perfect solution for storing rolls of unused fabric. Finding a table wide enough to comfortably layout patterns and fabric can be tricky. You would think that the wider the work surface, the better. But if you can't reach to the other side of the counter, it's too wide. Realistically, most people don't have room for a surface that spans 60" wide. Since fabrics usually come in 60" and 45" widths and are folded in half for cutting most projects, the ideal minimum work surface is a counter that measures 36" across. The length will be determined by the size of your room. Plan enough space on either side and at the end of your table so that you can easily move around. If your chair is on wheels, don't forget to figure in enough space to push away from your counter when seated without hitting the wall. Lighting is a critical element in your planning. If you're starting from scratch and have the budget, can ceiling lights are an excellent option. Also move one or more electrical outlets so they can be reached above the counter height. It will eliminate the need for snaking extension cords or crawling under your table or counter to plug in a lamp. If you have a limited budget, place your work space close to a window and near an easily accessible electrical outlet where you can plug in an additional lamp, especially if you like to sew after dark. A comfortable roll around chair with back support is a must for working in the sewing room. Wheels allow you to easily reach items stored in drawers and cabinets. In addition, you can roll away from your machine to work at an empty area of your counter. I like to keep my ironing board set up behind my chair at a height of about 2.5". When I'm seated and finished sewing a seam, I just swivel around, press the seam open then return to my machine. A chair with armrests will make it difficult to get close to your workspace, so unless the counter is high enough to allow the arms to fit beneath it, look for a chair without arms. Many chairs come with removable arms. The best flooring surface for a sewing room is a no-care product like tile or wood. Pergo was chosen for the sewing room in our photo for its durability, no-fuss care, and sound insulation. With this type of flooring you can drop pins and accidentally run over them with the wheels of your chair and it won't leave a dent! You can also easily wipe off any marks made by fabric pens or markers. Even spilling nail polish remover will not harm the laminate. • Attach a strip of molding to the wall then screw large wood knobs onto it. Space the knobs about 18" apart which is a little more than the width of a standard hanger. The knobs are a convenient place to hang your works in progress. Consider another strip of molding on another wall at a different height to accommodate longer items. • Pages of pattern instructions and miscellaneous scraps of paper with ideas clutter a sewing counter. Get them off the counter by making a bulletin board that looks like a giant pincushion. Cover corkboard with red fabric and attach it to the wall with Velcro strips. The bulletin board is a very convenient place to pin up pattern instructions while you work so you can repeatedly refer to them. • If you're the kind of person who likes a little noise in the room, set up a TV where you can glance at it occasionally while you work. • Attach a magnetic strip to the underside of your counter and one to your yardstick. When the yardstick is not in use, get it out of sight by sticking it under the counter. • If you have the space, allow for an area that can be devoted to the ironing board so that you don't have to set it up each time you need to press open a seam. • Find a place for a full length mirror, even if it's on the back of the door. Having a mirror in the room will eliminate the need to go to another part of the house to check the fitting of a garment and possibly dropping threads or pins along the way. • If you have a hard surface floor, place a colorful scatter rug inside the doorway. Because stray threads and fabric fibers tend to drift across the floor each time you move, the rug will help contain them, keeping them from spreading outside the sewing room to other parts of the house. • Make your room a place you find visually pleasing. If you have the space, add some graphics using stencils or project images on the wall and trace them. Once your design is complete you can add color. This wall was designed by arranging colorful thread spools, a wild measuring tape, and scissors positioned to cut a dangling thread from above. A basket hanging from a knob, holds a silk plant. If you plan to spend a lot of time sewing or crafting, why not make your environment interesting as well as functional! 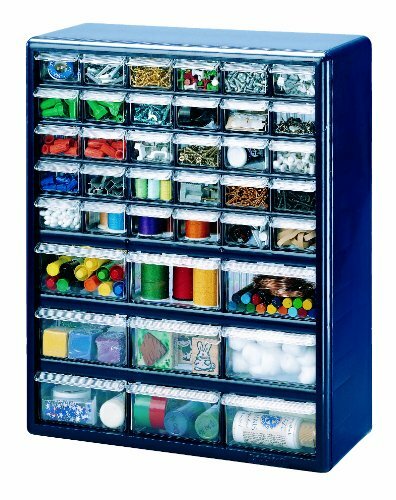 My favorite organizer stores thread spools, buttons and other small objects. Fabulous details that should help anyone set up the sewing or craft room of their dreams. It is great that you were able to find such affordable cabinets and counter tops, and impressive that you were handy enough to do some of the woodwork yourselves! Great photos! I would like to move into this beautiful sewing room. I have a sewing room, but not like this. My contains a mix match of items and they serve their purpose, but yours is so pretty and organized. I know you will enjoy it. Thanks for sharing. I appreciate your comment southerngirl! Hope you get your dream room someday too! Excellent article and a fantastic room. My grandmother had a room like this when she was alive. I am so envious. Wow, diva, what a beautiful room and so organized! Thanks so much for the useful information. Thanks Lynsuz. Creating a new craft room is a great way to start the new year! Good luck! Very inventive and beautifully done. Thanks! I had some very competent help! I want this rooom!!! !This is a beautiful article-thanks! Your ideas in this article are so great, I'm going to share this article with my friends on Twitter and StumbleUpon. Thanks southerngirl! I appreciate the support. I love sewing. I have to go to my mom's location where there is a Singer wonderful machine to do this. but maybe ... one day I will have my own sewing room. It is so nice to do by yourself some of your clothes or just embellish them. Thanks for this wonderful article. Congratulations on another wonderful featured article! Appreciate the comment Lucie II! Nice write up! Very informative and worth bookmarking for the sewing enthusiast. Oh, I love this room. My only problem with having a small home is the challenge of planning a "sewing or craft" corner - but I look forward to it. Also a great place to craft and wrap gifts. Wonderful use of space. Thank you for this article. Great article, makes me want to make my own private craft nook! Just added a link from my sewing article to here. Thanks Lynsuz! I appreciate it. Wow, this is a very neat sewing room and station. Have you had the chance to "break" it in with cutting out patterns and sewing? This is so well organized - I loved it! I will use your suggestions for my office if you don't mind. Thumbs Up! I'm glad you will be able to put some of my ideas to use. Thanks for the read and the thumbs! I'm in the process of redecorating the study and turning it into a sewing room. I really liked those little storage boxes for the threads and buttons. At the moment mine are all just loose and it's difficult to find anything. I think it's time for another trip to Ikea! How lucky for you to have the space for a dedicated sewing room! I was just at Ikea last week and bought more storage. They have some good choices for items larger than buttons, which is what I was after that day. But for the really small things, there's a better selection of containers at any Lowe's, Home Depot or most home improvement stores in the tool department. They use the multi drawer units for things like nails, washers, screws, etc. so they carry a good selection. Best of luck with your redecorating and thanks for the read! TIP: Take the largest size thread spool you use with you when you shop to be sure it will stand upright in the compartment. wonderful article. this is truly my dream room for sewing projects. lucky for you to have the space to truly do it right. thanks for sharing. What started as my craft hobby room turned into my workplace at home. I now use the room to earn an income and it's all because I had the space to dedicate to it. You never know how these things will evolve! Hope you get your dream room.